You are currently browsing the tag archive for the ‘Community management’ tag. I’m in the process of finishing a short ebook called “Crafting Community Guidelines,” which I started a while back to help first-time community managers with the tall task of community governance. As I went back to make updates and prepare the layout I found a few of my old blog posts that were written when I was deeply involved in managing a community. In the post: “Guidelines are important, but interpretation is key,” I wrote a lot about not being a robot and having the ability to act on your emotions. This is not to say that you shouldn’t adhere to guidelines, but that there are sometimes exceptions to the rule. It is important to have community guidelines. They are imperative for any online community. Members need to know what is expected of them and what types of behaviors are frowned upon or prohibited within the community. I remember creating the guidelines for the community I manage. It was laborious but imperative. I scoured the internet for guidelines from other communities and then thought a lot about what kind of community I’d like to see take shape. Writing such guidelines can make you feel as though you’re building an environment where all will be well. You think that people will refer to these guidelines and perhaps even follow them. But having those guidelines in place does not make every call I make as a community manager, an easy one. In fact, I rarely go back to them when making tough decisions. Guidelines are a starting point. Interpreting those guidelines is how you become an effective community manager. The way you do that interpreting can make or break you. This job is not about being a robot. It’s emotional and we are human.You can stare at the guidelines all day long and never get the answers you need when things get complicated. I know that many of my peers will argue the point and say that guidelines are guidelines. You follow them or you go. But it’s not that easy with me. Let me illustrate why I feel this way: A few months ago a long-time member had posted several comments and even a blog or two that were directed at another member. The comments were mean and degrading. It was really out of character for her. Were those comments abusive according to the guidelines? Yes. I could have stopped right there, marked her comments and blogs as abuse and she would have lost her posting privileges, community profile, the works. In most cases, that should probably be the outcome. BUT…I knew that her dog had just been hit by a car and died because she’d been blogging about it since the day it happened and it looked like she was responding to someone who had been taunting her about that. His comments, however, had NOT been reported as abuse so it all looked very one-sided. I sent her an email letting her know that I was not going to dock her for the comments because I knew she was in an emotional state. But I also warned her that she must take control of her emotions because I would not do it again. She responded with great gratitude and apologized profusely for allowing herself to get sucked in by someone else and for resorting to such antics. She said that she just couldn’t take it because she was feeling guilty about letting her dog run out into the street and his comments about her negligence pushed her over the cyber-edge. She did not want to lose her privileges. For me, that was time well spent. I know it doesn’t scale, and that’s a real issue for me as the community grows, but that’s the kind of community manager I like to be. One who can empathize and know enough about the members to make a difference. This post was inspired by #CmtyChat, (created by Sonny Gill and Bryan Person) a weekly meeting of the minds where community enthusiasts chat via Twitter about all that ails us and then some. Note: You can expect to see the ebook referenced earlier: “Crafting Community Guidelines” in a few weeks. This day of appreciation may not be on your radar, but it is certainly on mine. The brainchild of Jeremiah Owyang, this is a day that is near and dear to my heart and one that allows us to reflect on the hard work that goes into the craft. It is not a science, but an art and anyone who holds this role has my unwavering empathy and support. I can’t remember a time when I felt more alone, under appreciated, but yet completely enthusiastic and exhilarated, than when I was the community manager of GOLO, at WRAL.com. If you read this blog on a regular basis, you are quite familiar with the ups and downs I experienced launching and growing that online community from zero to more than 13,000 members and the heart ache that came along with it. 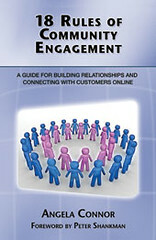 If you read my book, “18 Rules of Community Engagement,” you probably know even more. Community Management is tough and it takes real comittment to see it through. It is not a job for the faint of heart or those who lack motivation and drive. But that’s not what tomorrow is about. It’s about you. If you’re a community manager, pat yourself on the back. If you participate in online communities, say thank you to the folks who put out the fires and keep it interesting. It isn’t as easy as it looks. And if you have the time, check out the hashtag #CMAD. I’m sure it will be blowing up the twitterverse as very well it should. Happy Community Manager Appreciation Day to those on the frontline and deep in the trenches.I support you more than you will ever know. I spoke at Internet Summit 2011 yesterday on the truth about community management. I have heard such great things about the content in person and online, particularly on Twitter and I am so happy that people found it helpful. I always strive to be honest and forthright about my experiences and never sugarcoat what it takes to grow an online community. I figure since there are so many people out there telling lies and spreading myths about social media, I am not needed to perpetuate the trend. I did post a link to the presentation on Slideshare, but I’m also posting it here for those who may be interested. Enjoy. And let me know if you have any questions. as you probably know, I can talk about this all day. It is not easy being a community manager. It seems that many people are content to call themselves community managers because they manage a Twitter account, post content on a Facebook fan page (with the goal of “engaging” the masses, or at least those who actually visit the page or allow posts on their newsfeeds) or run a group on LinkedIn. I’m still not sure how anyone actually “manages a community” on Twitter beyond hosting a regularly scheduled tweetchat, but that’s a subject for another day. The focus of this post is how community managers actually communicate with members, so I will stick to that for now. If you spend your time posting comments like: “That’s awesome,” “Great idea,” “Tell me more,” “So happy you shared that with us,” “Tell us what you think,” and “Share your thoughts” you aren’t managing anything. You’re not even thinking. You certainly aren’t going to grow much of anything. If this is how you communicate, your job is easy. Make no mistake, there is nothing genuine about such emptiness. But once you start posting those types of comments, you will continue to do so for the long run. You will fall into a trap that allows you to believe you are engaging when you are doing anything but. You need to invest more if you want to see a better return, and if you don’t think you can do better, you might want to reconsider your current role. I recently discovered that I posted more than 7 thousand pieces of content on the community I managed for a little over 2.5 years. That’s a combination of comments, blogposts and images. I knew that I had to be one of the top contributors if I wanted others to do the same. Yes, there were times when I posted short comments or told someone that their blog was awesome, but it was by no means something I did very often, and was typically followed by at least one other comment. Because I like to lead by example, I will share with you a few samples of comments I posted to users in my next few posts, so be sure to subscribe to the blog if you want to see these samples of engagement in action and how taking a genuine interest in community participants can make a real difference. I am happy to announce the release of my very first Special Report. 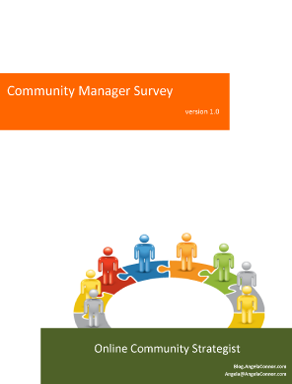 The Community Manager Survey provides unique insights from 50 practicing community managers. It’s a in-depth look at the common struggles and intricate details of what it takes to succeed in a role that is growing in importance but commonly misunderstood. The participants were open and honest, and their answers are quite revealing. I simply cannot thank them enough. The report is geared toward managers looking to hire for this key organizational role and those interested in gaining a better understanding of the major issues associated with community management. I’d like to send special thanks to the sponsors of the report: Social Strata, emoderation, comBlu, Sociia Internet Communications and Linqia Marketplace’s The Moderator Community. There is a fee for this report. The information is valuable for businesses and took time to compile and create. Survey sponsors and participants will receive a free copy. If you know someone who would benefit from this report, please spread the word. And let me know if you’re interested in a review copy. Anyone who purchases will receive an additional report on the art of crafting community guidelines. We’ve been talking about the importance and value of this role for two years now. It’s a conversation that must continue. I’ve received quite a few emails over the last year about some of the nuances of community engagement. It is also something I’m often asked after speaking engagements. People wonder how much time they should put into their communities and what it really takes to keep people interested, engaged and coming back for more. I think it is important for every community manager to spend time communicating with members publicly and even privately through email when warranted. It keeps you in touch with the masses and makes it an even more personal experience for members. It also helps you keep your finger on the pulse of the community, whcih is extremely important. I’ve gone through some of the comments I’ve posted in my community and picked out a few from the last 2-3 days to share with you here. Some may be out of context since you are only reading my side of the conversation but the goal is to illustrate the personal approach I take with community members and how I work to blend right in, and not necessarily come off as the intimidating all-knowing person in charge. Enjoy! This is just some food for thought heading into 2010. Kick your engagement levels up a notch and see what happens. If you follow me on Twitter you know that I spent most of the day at the Social Media Business Forum. Actually I am still here. I am sitting in the second to last row at the Blogger Relations panel with Lucretia Pruitt, Ilina Ewen and Kelby Carr. It has been a really good conference so far. I attended a session earlier today on Building and Managing an Online Community with panelists Patrick OKeefe, author of Managing Online Forums Laurie Smithwick of Kirtsy and Ryan Boyles. During that session I commented during a question I asked that you are not a community manager until you have dealt with trolls who threaten to bomb your car. That was re-tweeted quite a bit and even called the tweet of the day, by Gregory Ng. But the thing is, I am dead serious. My issue is the casual use of the title “community manager” that now somehow encompasses customer service reps and anyone who monitors a brand on twitter or creates and manages a Facebook fan page. Yes, you are reaching out and even communicating with the community but that is not enough. Until you have been in the depths of this craft by nurturing and growing the community, reaching out to influencers, contributing massive amounts of content, dealing with relentless trolls and working hard to be an advocate of the community to bosses who may not necessarily understand what your work entails, I am not going to acknowledge you as a community manager. There are many of us who take this work seriously and are put to task on a daily basis dealing with all that comes our way. And it is not pretty. Laurie Smithwick answered my question saying that people like us need to hunker down and just do what we do and it will all be clear in the end. We are still in the very early days of social media and this is going to happen so I really need to just get over it. But right now, I find it annoying. I will hunker down next month. For complete coverage of the Social Media Business Forum, search the hashtag #smbf. I also have a few photos on Flickr. This is another rant from the trenches. If you’re not in the mood, perhaps you should come back to this one later. I probably received 25 emails last week from members of my community about the most petty issues. There are times when I feel like a real babysitter and I have to tell you that before I took my vacation back in August, I was at risk of completely losing it. I found myself so caught up in what I felt at the time was my inability to reign in trolls and the sheer nonsense that was taking place within the community that I could scream. Actually I think I did scream something like “I hate these people.” I certainly don’t hate the community, but I am beginning to wonder if there is some kind of breaking point or designated period of time when it just burns you out and you need to do something else. I’ve said many times that this is no job for the weary, and weary I am not. But tired, I am becoming. I know that not every community manager will experience this because no two communities are the same. And depending on the makeup of your community, you may never feel this way. Many members of the community I manage have no idea how bad it can really be on the internet. Some are hyper-sensitive and believe that any comment that isn’t in line with their beliefs should be marked as abuse. They meet one another offline and bring innuendo back into the community based on these meetings and expect me to intervene as if I have knowledge of what happens outside of the community. I’ve made it very clear that I don’t want the back story and will manage the content based on what I see on the surface. One woman told me that another member has threatened to call her job and inform them of how much time she spends interacting in the community during the day. I feel bad for her, but she’s the one who told her where she works. That is not my problem. And in all fairness it is not a reason for me to ban her because she hasn’t violated our TOS, at least not on the site. Another user is up in arms about someone implying that he is a communist and wants me to deal with it right away. Someone else says an online foe is stalking their comments and following them around commenting on every blog they comment on. I’m also dealing with claims of what is supposedly a rogue group that targets specific members. It has gotten so bad that I had to address the issue in a blog post last week that made me feel like a middle school teacher. I swear it gets so very childish and last week really took its toll. If you ever want to see some of this for yourself, read the comments on my profile page. There are some nice comments there, but also some real doozies. Okay, I feel better already. Next week has to be better. Remember that cool new feature you launched in your online community six months ago? What about the one you launched 18 months ago? How much do you want to bet that the members who joined the community in the last month or so may have no idea that those features exist? As the community manager who is always looking for ways to enhance your offerings, attract new members and keep your community interesting it’s easy to lose sight of the revolving door. New members need some of that nurturing you provided to the very first members when you launched. Sure, they could have been a lurker for 6 months who finally decided to join and already knows the ins and outs of the community, but what if they weren’t? I had a newer member ask me just today if there was a way to upload multiple photos to her image gallery because uploading them one-by-one was a bit tedious. I was so glad she asked and I steered her to a blog post I’d written when we started accepting zipped files, back from September of 2007. That was just two months after our launch and I thought most people knew how to do that. I’ve been thinking about this for about a month now and just got around to blogging it. Another thing I did recently was remind members that we offer RSS feeds on the blogs. With many of them spending time on other social networks I figured that they may not have known they could feed their GOLO blogs there, and many commented that they did not. Actually it’s an easy way to get our brand onto the other social networks so if they use the RSS feature it’s a win-win for us. What features have you launched that some of your community members may not be aware of? Give it some thought, and remind them. What’s old to you could be new to them. Breathe new life into those old features. And come back and let me know how it goes. There are a lot of folks out there who understand how social media can help businesses and organizations thrive. There’s also a lot people out there acting as if they do, and don’t have the real experience to back it up. As someone who manages an online community that I also launched two years ago, I am in the trenches daily. If you are a regular reader here, you know that I share my ups and downs and hard-earned advice. It is no walk in the park by any means. My blog is a continuation of those rich details and advice. There are many bloggers who do the same. I read them faithfully and learn from them. I value their input, insight and the work they do and have done in this space. There are some though who simply repeat information from other bloggers and I am slowly but surely weeding them out of my RSS feed. One issue I have is this unfounded idea that growing your own community through various social media platforms somehow automatically provides the ability and know how to run, grow and manage an online community as a full-time job. It does not. I read at least five press releases each day about new company X advising on community building or Big Brand Y building a slew of online communities and what I hardly ever see in these release is information about who will manage them and take on responsibility for their growth. It’s almost like it’s an afterthought, and it should be the first thought. This is serious work. Why do you think most online communities fail? It’s because there is no real ownership and the “if you build it they will come” mentality. It’s because many of the big-wigs think their products are so unbelievably exciting and interesting that consumers will bang down the doors to interact with their brand, in their space and on their terms. This is not true. It may be true for some exciting brands but it won’t last if there is no ‘resident nuturer’ charged with making it a success. As you are seeking people to help you with this kind of work, look for experience. Sure, big names are nice, but a big name may not always be able to deliver what you need. Am I that person? If you are all about engagement tactics, I will go out on a limb and tell you that I am, because engagement is my thing. It is what I do and love. I have also created social media guidelines for my company, something that I rarely talk about in my blog and I’ve worked with a huge restaurant chain to do the same. Again, things I don’t readily talk about. I want people to contact me because of my work and not necessarily the people I’ve done it for. That might be backwards and a little naive and I may change that at some point, who knows…but it’s important to understand that there are people out there doing the work you need who just arent’ selling it on every corner. This is a personal blog. The opinions expressed here represent my own and not those of my employer. Feel free to challenge me, disagree with me, or tell me I’m completely nuts in the comments section of each blog entry.